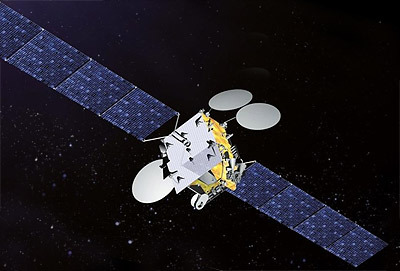 Telkom-3S is a Indonesian geostationary communications satellite replacing the Telkom 3 satellite, which was stranded in an unusable orbit. Thales Alenia Space announced in July 2014 that it has signed a contract with PT. Telekomunikasi Indonesia TbK (Telkom), to build a new telecommunications satellite. Telkom-3S will increase the operator's C-band capacity from its orbital position at 118° East, and will also offer high-definition television (HDTV) and remote GSM/Internet services in Ku-band. Thales Alenia Space is program prime contractor, with responsibility for the design, construction, testing and in-orbit delivery of the satellite. It is also in charge of the launch and early orbital positioning phase (LEOP) and in-orbit tests (IOT). In addition, Thales Alenia Space will supply control center components and will train a team of engineers on site. Built on Thales Alenia Space's new-generation Spacebus-4000B2 platform, Telkom-3S will be fitted with 24 C-band transponders, 8 extended C-band transponders, and 10 Ku-band transponders. The C-band payload will cover Indonesia and Southeast Asia, while the extended C-band payload will cover both Indonesia and part of Malaysia. The Ku-band payload will specifically cover Indonesia. The satellite will weigh about 3,500 kg at launch and offers payload power of 6.3 kW. It was launched by Arianespace by the end of 2016 for a 15-year expected lifetime.